Hocus Interior design studio was established by Marcelle Crowther (B. Sc Home Economics Ed) in 1995 with the vision of inspiring traditional and contemporary spaces where the delicate balance of form and function is maintained. Marcelle’s work has appeared in various interior design publications, and her house where she lives her vision, has been featured on Top Billing. 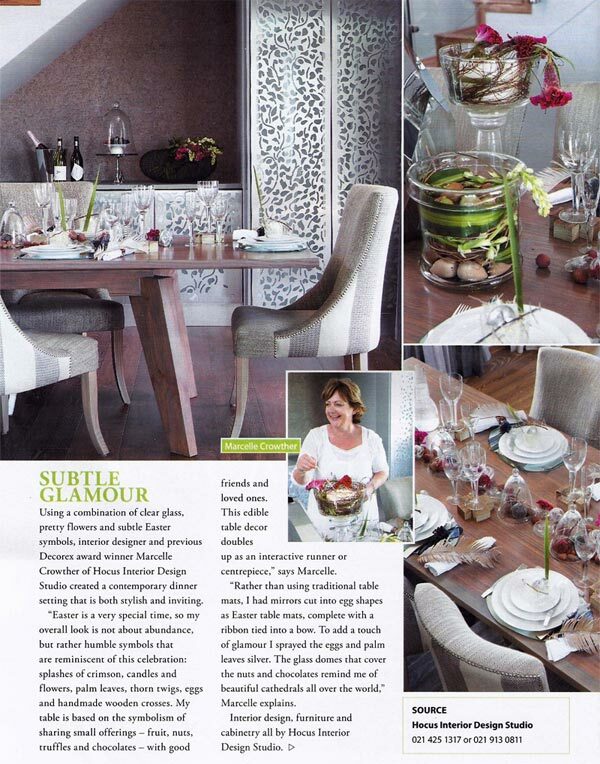 She has also won numerous awards for best stand at Decorex Cape Town. Hocus Interior design studio provides high quality design services for residential and commercial projects both locally and internationally. As a multi-disciplinary practice with full time interior designers and architects; Hocus combines bespoke interior design and architecture in an alluring way to satisfy the senses and create a harmonious, undiluted setting. We adapt ourselves to each project as every project is exclusive and every client is unique. Hocus prides itself on its ability to create high end results for its clients, while they enjoy the journey. Plascon award for best use of colour: Marcelle Crowther for Hocus Interior Design. Selected by Anne Roselt, colour manager of Plascon as the stand with the most inspiring use of colour, Marcelle Crowther used space as a stage for drama and surprise. The stand brought together many interesting and over-scale elements, mixed beautifully without being over-decorated. Shades of lilac and coral, blow-up scatter cushions on an s-shaped couch in stark white leather, lace-like cut out wall panels, reflective surfaces, organic shapes, concrete seating, Perspex trees, crochet poufs and gigantic shell-shaped paper maché floor lamps drew the viewer into the fantasy scene.